Contact us for professional Skunks trapping, removal, odor control, and clean-up services. If you're a do-it-yourselfer, check out the suggested techniques below. 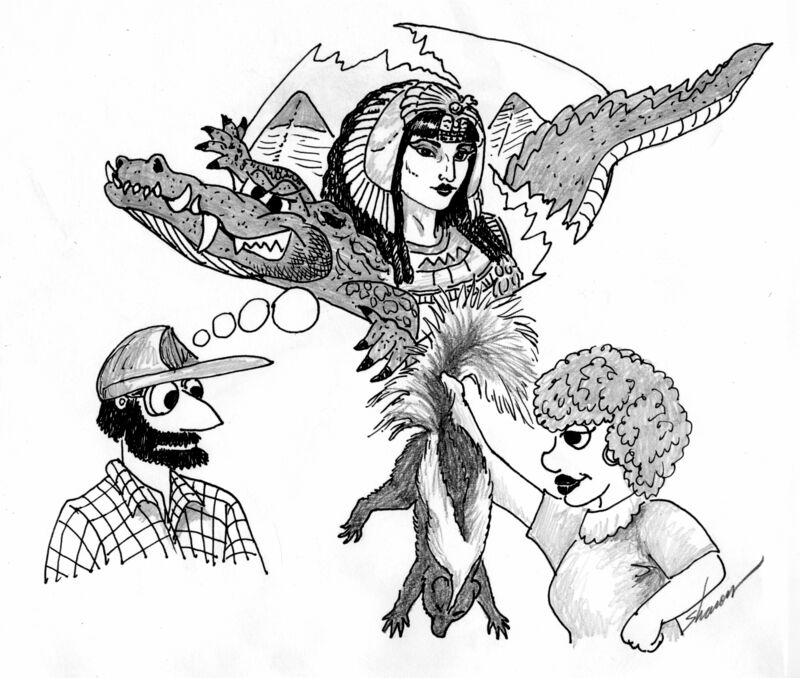 Why do we want to keep Skunks Around? Skunks, though they may stink, are helpful to the environment and even to humans. Did you know skunks eat just up to 70% of all insects that are known to man? They forage and keep bugs out of your lawn and garden, unfortunately this usually involves digging. Skunks not only eat bugs, but they are also incredible when it comes to catching mice and even snakes. The problem is, that while they're close proximity to humans help shrink the insect population, it also causes quite a stink; and quite a mess. Why do we get rid of Skunks? The main reason people want to get rid of skunks is for the obvious fact: they stink. Skunks are timid in nature and won't attack an animal unless they are protecting their young. A skunk may feign a charge toward you before moving back and curling away. 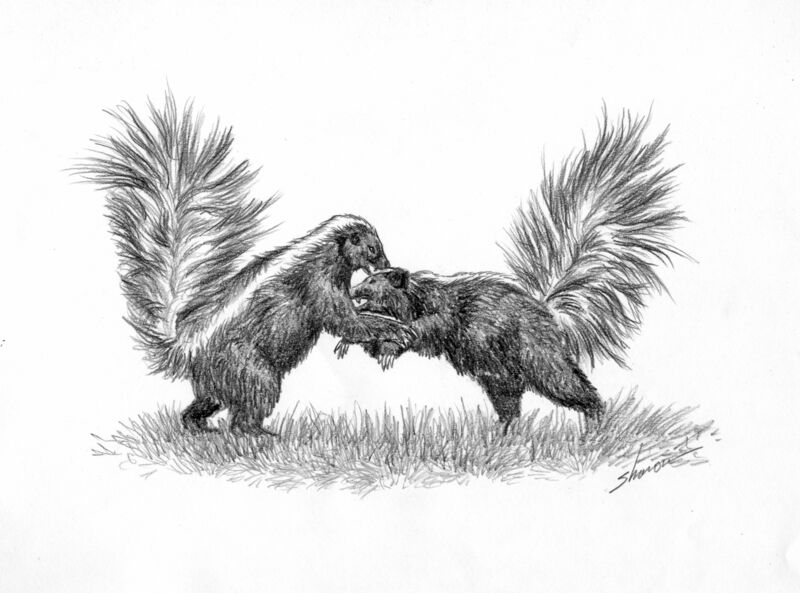 Skunks don't just spray for the fun of it, but if they're frightened they will spray animals and even each other. Not only does their spray stink, but when skunks get under a porch or crawlspace and can't get out, they can die, rot, and smell up your house with more than just the typical scent. Not only do skunks have a horrendous odor that can be smelled up to several miles away, but they also dig in gardens and yards searching for bugs, and can cause damage in your home. Another important thing to remember, is that skunks are one of the top transmitters of rabies. While these days it is treated in most cases, and hardly anyone gets close enough to a skunk to be bitten, but it is still a danger and should be considered at all times with ALL wild animals. When skunks die, if they are ran over or attacked by another animal, they will typically spray. If they don't spray when they die, then it will be a while before you will smell anything. However, once the body starts to decay, the skunk spray will ooze out from the sacs inside of the skunk as it rots. Once this happens, you are stuck living with the smell of a rotting animal, and the smell of skunk spray. Dead skunks are best removed with rubber gloves and a shovel and then taken to a burn plant to be incinerated. If a skunk is dead on city property like a road or other, you can clean it up if you'd like or it would be better to call your local humane society or Best Friends of Animals Society. We do not remove dead animals off of city and/or county properties. A skunk's spray can reach 10-15 feet away, and when a skunk sprays, a yellow/green goo is left on the object it that was sprayed. If it is possible (if it's left on concrete or a rock), burn this with a torch. Don't try to wash it with water that will only make the smell worse. If there is clothing that is sprayed, it is easiest to burn the clothing along with any goo and even the skunk (if it is dead). Remember, skunks use their spray as a last resort when they feel threatened. If you have a skunk spray near you, you may gag or throw up from the scent but don't worry, it's not dangerous to anything but your nose hairs. One of the biggest problems is that when a skunk sprays, the item it was aiming for is never the only thing affected. Anything within a close vicinity or that comes in contact with that object/animal will be contaminated by skunk spray too, such as: carpet, drapes, bedding, clothing, etc. It is hard to trap and remove skunks because they might spray if they feel they are threatened. When dealing with skunks, it's important to check your local laws. In some areas it may be illegal to relocate skunks. In most cases, the best way to deal with skunks is euthanasia. If a skunk just accidentally wanders onto your property or it is legal to relocate, release may be the choice for you. Consider the possibility of their return, and the awful smell when making your decision. As soon as you know they're there; if left unattended to, skunks can cause a lot of damage. Not to mention if it's in a crawlspace or another area where they can't get out, the animal may die there. Then, you're left do deal with the carcass AND the smell. Look for holes and places that have been scratched and dug at near the base of homes, sheds, and trees. They will be about 4-5 inches high and 6-8 inches deep. You may also notice holes in your yard and garden where the skunk has dug for insects. Skunk feces looks a lot like cat or small dog droppings but more scattered and usually contain insect or small animal skeletons and berries. They are often found near the skunks den so if you've seen a skunk around, or can smell it under your house, chances are what you're looking at is skunk poop. Skunk droppings can carry a disease called EPM (protozoal myeloencephalitis) that is a dangerous neurological disease that can affect horses and is traced back to skunks. While you may not have horses, skunk waste can also carry diseases like salmonella and leptospirosis that can harm both humans and pets. Use a shovel and gloves to remove the feces from the area either burning it, or tossing it somewhere where no pets or people will come in contact with it. The most important thing to remember when cleaning up skunk waste, is that if there were no skunks there would be no poop. Removal of the animals itself is the best option. Skunk entrances are best blocked by concrete or heavy duty wood and planking; a heavy duty screen can also be used. We also install special skunk fencing that can be purchased called 'Slip Sheet'. Skunk's rarely get into attics, however, if the edge of the roof butts up against a mountain side or hill, a skunk can walk in and fall into a place they can't get out; skunks are not good climbers. If you smell skunk in your attic and your house is not near a hillside, it may also be a raccoon or other animal that was sprayed by a skunk. Refer to earlier section or to an internet source. Trap them, remove them, and block them out. If a skunk is able to get under your house it might not be able to get back out. While the skunk is attracted to the heat and protection that is provided, they don't consider the lack of food and often starve to death. At this point, getting rid of the body and the skunk spray becomes the biggest issues. It's best to stop the problem before it starts by getting skunks off your property and covering any holes that may go through underneath your home. This is applicable for sheds and barns also. It is very seldom that a skunk will get into a wall; however, they may get inside of a crawlspace that will give them access to walls. Sometimes, skunks will fall into an opening into a wall from the foundation or framing of the house. Once they fall, they can't get back up, again skunks are poor climbers and can't maneuver their way out without a simple stepping system. When venting is located underneath a house, problems with skunks are common. Skunks will dig into and rip the vent off to get into the structure when they sense warmth and protection. Once they get in and they can lost or can't crawl/climb back out. These low-vents are located only about 4-6 inches off of the ground and prove easily accessible to the animals. Skunks underneath porches is a HUGE issue. Since decks are usually at ground level it is easy for a skunk to dig underneath and build a den for it and possible it's young. It is important that you locate the entrance, trap and remove the skunk, and block the entrance as soon as the animals are taken care of (we sell a product called 'Skunk Slick Fencing' that works very well). Check local laws before releasing or euthanizing the animal(s). If animal is killed, take it to a burn plant to be incinerated. With all animals, this is tough to do. You want to block any entrance they have that is allowing them to get underneath barns and sheds. Skunks are very shelter driven, since they eat bugs, rodents, snakes, plants, and berries, food is easy to find for them. Again, check local laws before killing or relocating the animals. Any skunks that are killed should be taken to a burn plant. What usually happens is that they dig through a low vent or underneath a foundation and find their way into the level between the ceilings of a basement the floor of the first level in a home. There have also been instances where skunks crawl through small holes near the foundation or where pipes go into a crawlspace. If there are any openings they will take advantage of the protection and warmth. Try to find the entrance, trap the animal, and remove/euthanize it. Depending on where the animal is located, it may be best to call a professional, it can be tricky work. Either tip the garbage can or dumpster over so the animal can crawl out. If a skunk is trapped in a window well, call a professional on this site unless you would rather try to pull it out and be sprayed. NEED HELP GETTING RID OF SKUNKS? If you are having problems, or don't want to deal with the skunks yourself after reading this article, please give us a call at 1-888-488-7720, you can also contact us through email. You can also call one of the technicians from your area and they can help you figure out a solution. REMEMBER: Skunks can be dangerous and working with them can be very complicated; it's best to hire a professional. Check out our YouTube channel and our website, AllstateAnimalControl.com, or use other Google resources to help you solve your problem. We do offer coaching solutions. Please send digital photos of your problem and we can coach you over the phone and ship you products for a fee.